The outcome of France’s upcoming presidential elections may be the most difficult to predict in many years. The name of the anticipated winner has changed several times over the past few months. The conservative party’s primary election ejected several seemingly credible candidates from the race. The far-right populist party Front National has become the leading party in terms of vote share at the regional elections of 2015, and its president Marine Le Pen is more popular than ever. The Socialist Party, which was bound to experience a humiliating defeat in 2015 has suddenly started hoping again. And the former Minister of the economy, Emmanuel Macron, though not supported by any major party, has looked more and more like a credible contender. In the light of such uncertainty, media pundits have been refraining from making any further guesses in recent days. Whatever the result, this election is likely to profoundly reshape the French political landscape. The current party system looks poised for a forceful reorganization. The steady progress of the Front National and the decline of traditional government parties are increasingly clear, probably questioning the very foundations of the French 5th Republic. A rethinking of the current institutional setup may be necessary. Several major issues or stakes have dominated the news in the first few months of the campaign. First, the conservative party, Les Républicains (LR), organized open primaries for the first time at the end of November. Former Prime minister François Fillon’s large victory over initially more popular candidates came as a surprise. However, a series of controversies, especially regarding the alleged fictitious employment of his wife and two of his children have weakened his bid – maybe fatally. He remains nonetheless one of the most credible contenders for the time being. On the left, for a long time the major question was whether François Hollande would stand for re-election. When he announced on December 1st that he would not – a first in the 5th Republic – a new race started, culminating in the equally surprising victory of party left-winger, Benoît Hamon in the Socialist primaries at the end of January. He will be up against Jean-Luc Mélenchon, who is supported by the Communist Party and the Parti de Gauche, who is likely to maintain his presidential bid nonetheless. Finally, the main players of this presidential election may be none of the above. Marine Le Pen is widely expected to top the poll at the first round of the presidential election in late April, though a victory at the second ballot remains unlikely – so far. The real question is who will be facing her. At the time of writing (mid-February), it looks as though newcomer Emmanuel Macron stands a serious chance of taking up that role. As the dynamics of primaries have pushed left-wing and right-wing candidates towards the extremes, his economically and socially liberal positions have won the support of large sections of middle-class center-left and center-right voters. In the event of a run-off between him and Marine Le Pen, there is little doubt that he would obtain an overwhelming victory. Whatever the result, this election is likely to profoundly reshape the French political landscape. Beyond those short-term considerations, these elections illustrate several long-term trends. France is facing a series of major challenges regarding the future of its economy, but also its welfare state. In this context, successive governments’ stances with regard to European integration have become more and more erratic, as they have in other areas, too. It is probably the contradiction between the tradition of “grand politics” and the reality of ever greater international interdependence that is today challenging classical political parties. This is visible in the evolution of the party system and, more generally, political representation in France. New issues are dominating political competition and are profoundly affecting electoral dynamics. Issues such as the impact of globalization and Europe are playing an ever greater role in the domestic political debate, fueling the importance of identity-politics. The outcome of the upcoming presidential and legislative elections may thus completely upset the political status quo. The danger is great for the two historical political blocks to be dramatically weakened and to enter a period of profound crisis. Looking at the elections and related political trends may not be enough however. We have shown elsewhere that France is engaged in a vicious circle of political alternation and subsequent disappointment that has been ongoing for decades now. It is the results from of an institutional setup that creates a very powerful, but politically irresponsible president. The latter dominates a Parliament which -despite some recent improvements – remains politically weak. Expectations are exceedingly high among voters, fueled by candidates who do not hesitate to make spectacular, albeit unrealistic pledges. The institutionalization of primaries has added further complexity to an already complex game. Even if the 2017 elections end up maintaining a fragile status quo – e.g. by leading to the election of a socialist or, more likely, a conservative (i.e. Republican) candidate – there is clearly a need to rethink the underlying logic of French political institutions. A move towards a more consensual political system should dampen expectations, create less frustration and reduce the appeal of populist solutions. But it may take a profound crisis to raise awareness about these problems. 2017 may become a crucial year in the history of French democracy. Featured image credits: LEWEB 2014 conference in conversation with Emmanuel Macron by Offical LEWEB photos. CC-BY-2.0 via Wikimedia Commons; François Fillon at the UMP launch rally of the 2010 French regional elections campaign in Paris by Marie-Lan Nguyen. CC-BY-3.0 via Wikimedia Commons; Marine Le Pen by Foto-AG Gymnasium Melle. CC-BY-SA-3.0 via Wikimedia Commons. Emiliano Grossman is Associate Professor at Sciences Po and Centre d’études européennes. 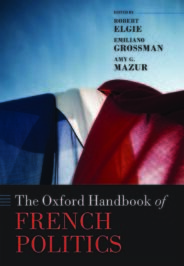 He is one of the co-editors of The Oxford Handbook of French Politics.